Through the MIT’s initiative called the Environmental Solutions Initiative, the MIT has been working on topics such as urban metabolism, climate change and the impact of the achievement of the Sustainable Development Goals (SGDs). MIT is widely recognised in its work on enviromental topics which is in line with its scientific capabilty, in engineering and politics, which helps address climate change and other environmental challenges directly linked to fulfilling the SDGs. The Director of the Initiative has also been a co-author of the Policy Brief of the Climate Action and Infrastructure for Development Task Force titled “Enhancing Climate Resilience through Metropolitan Governance”, in which it proposes promoting a focus on urban metabolism to strengthen the climate reslience actions in cities. Professor Fernández has been a great promoter of urban metabolism to move towards sustainable societies. 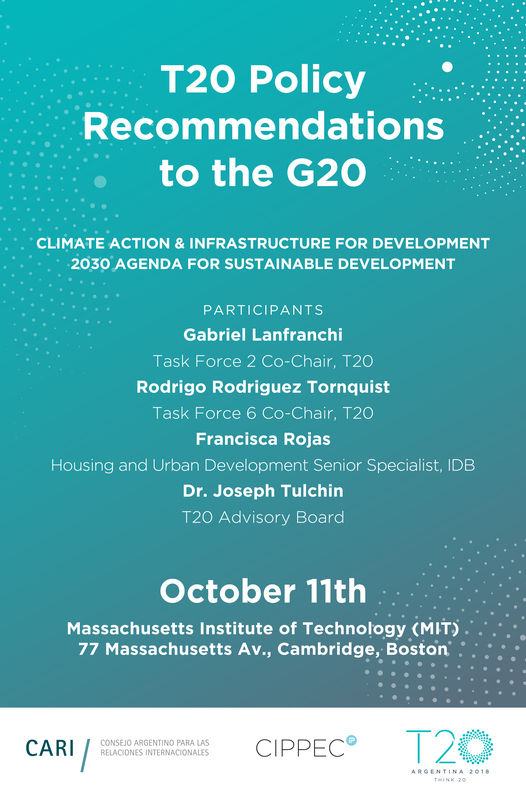 The objective of the dialogue is to present and share with the MIT public (students, graduates and professors) the recommendations proposed to the G20 by the Task Forces on Climate Action and Infrastructure for Development and a 2030 Agenda for Sustainable Development. Similarly, the T20, B20 and C20 Joint Statement on Climate Change and Energy will be presented. It is expected that there will be a segment to exchange opinions and dialogue in respect of the proposed recommendations, where all those present can participate. The material that will be presented are the Task Force’s Policy Briefs. There will be special attention on the proposals found in the T20 Communiqué. The dialogue will be led by co-chair of TF2 Gabriel Lanfranchi (CIPPEC) and the co-chair of TF6, Rodrigo Rodriguez Tornquist (CARI). This is aimed at MIT students, graduates and professors, with special emphasis on those who are part of the Environmental Solutions Initiative. Massachusetts Institute of Technology (MIT), Boston, EE.UU. Room 9-450ª.